How do I exclude ads that aren't supported in the Ad Creative widget? The Ad Creative widget is an AdStage cross-network widget that shows actual ad visuals just as they appear to your audience in the native network, along with selected ad-level metrics. Which ad types aren't supported today? How do I filter out ad types that aren't supported? Step 1: Jump into the Filter tab. 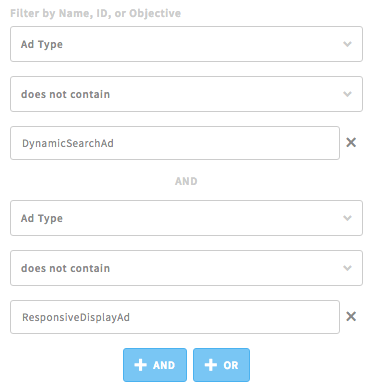 Step 2: Update 'Filter by Name, ID, or Objective' to Ad Type does not contain DynamicSearchAd, or whatever ad type error you are seeing in the existing widget. Step 3: Save the widget. Have questions about setting up Ad Creative? Feel free to reach out to us at support@adstage.io.